Did you know that black history month began as a weekend called Negros history week. 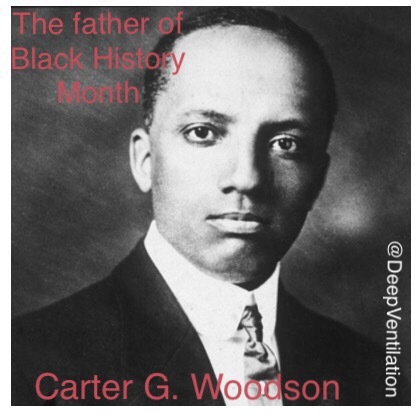 A special program created by an Historian Name Carter G Woodson to encourage people to learn about the history, the culture and to celebrate the achievements of Negros. It started February 1926 the week of Abraham Lincoln and Frederick Douglas birthdays. Later on, one week of celebration turned into a whole Month to honor Woodson’s Legacy. This month we honor those who took a stand, died and fought for freedom, inclusion, social justice, human rights and equality. The fight isn’t over, we are still fighting today. Thank you to Those who’ve paved the way for us, Not only through movements for change but also for your CREATIVITY. Creating things & products we use today, The poems we read today, The messages we share today, The History and lessons we learn today, The culture we have today, The marches we still do today. But most importantly thank you for giving us the courage to take a stand to fight for what we believe in knowing we can make change! !